Hollybeary Creations : Autism Blog Hop with YNS!! Autism Blog Hop with YNS!! Your Next Stamp is joining Veronica and tons of other amazing stampers to help raise Autism awareness! We hope you will help us spread the word and Hop along with us. There's going to be lots of fun prizes too - including a $25 E- Gift Certificate from Your Next Stamp! I created a Distress Ink Background on a piece of Distress Ink Watercolor paper and die cut the piece with the Large Stitched Rectangle die set. 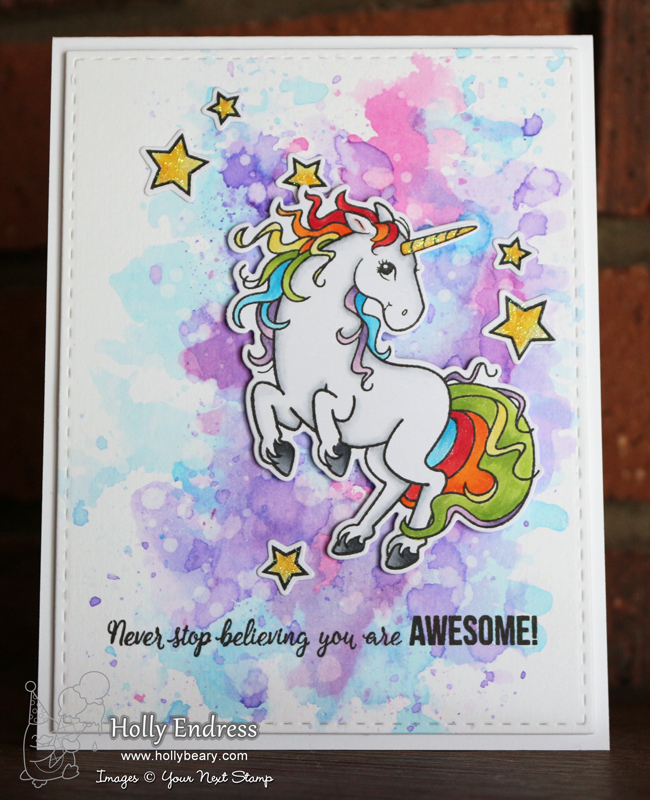 I stamped a sentiment from the Magical Unicorn Stamp set with some Black Olive Ink. Then I adhered the panel to a top folding A2 size card base with some foam tape. 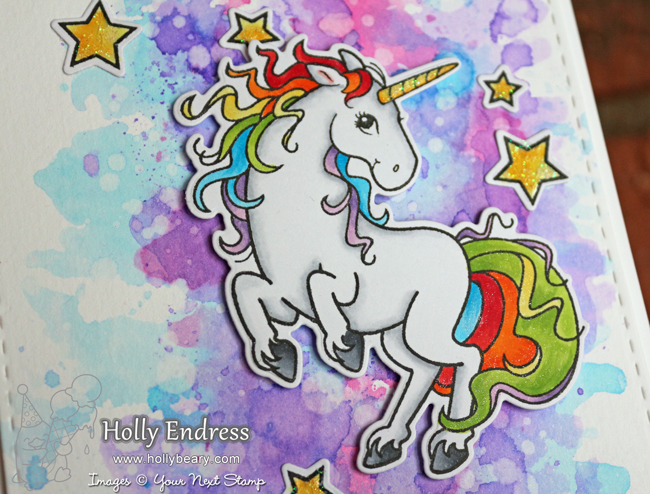 I stamped the unicorn image and the stars onto some X-Press it blending cardstock with YNS Black Olive ink and colored them in with Copic Markers. I used the coordinating dies to cut the images out with my Big Shot. Then I adhered them to the focal panel with some foam tape. For some sparkle, I added some Spectrum Noir Clear Sparkle Pen to parts of the Unicorn and some Clear Glitter Nuvo Drops to the Stars and the horn. Be sure to head over to the YNS Blog to see what Andrea created for the Hop! Such a fun and colorful card....plus, I for one, love unicorns! Thank you for the inspiration. Wonderful! Such a vibrant and happy card. So sweet Holly, love the rainbow on his mane & tail. Well done.